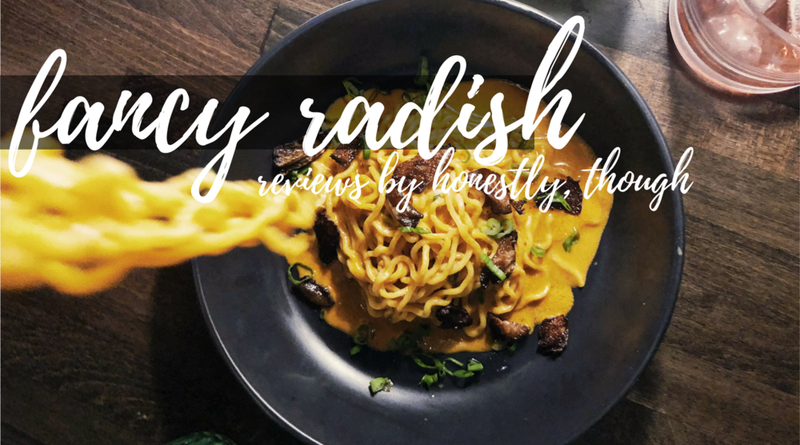 On Saturday, I went on an absolute journey at the newest place for veggie lovers — Fancy Radish. And in case you haven't heard of it yet, here's a little refresher. Superstar chef couple Richard Landau and Kate Jacoby have brought the masterpieces from two of their Philly restaurants (Vedge and V Street) to DC. And they’ve named it after one of their most popular dishes: Fancy Radish. The fine dining (read: date night!) spot has a menu split into three sections, according to the types of food being prepared and how full it should make you feel. But to be honest, everything felt like a shared plate and is presented as such. Maxim and I started with the first section, choosing one item, then moved down to choose one item from the other two sections and shared a dessert. It was an aggressive strategy, and I do not regret a single moment. The space itself is cozy without being too tight, airy, minimal and trendy as hell. The lighting is dim, the bar is energetic, and you can see right into the kitchen through the back. To me, it felt like the perfect addition to an already bustling community of hip, plant-based gathering places and eateries. The stuffed avocado is spread with romesco and topped with "fried" rice and cauliflower. I almost didn't order it, but at the last minute Maxim secretly ordered it for me, knowing it wouldn't be a complete dinner without a big dose of avocado's healthy fats. The fondue and soft pretzel is apparently a staple in Philly's V Street. — and the chefs wanted to try the dish out here in DC. I'd say it's a home run, and if I could have it delivered daily to my apartment, I would. Honestly, though. Our waiter, Adam, suggested the potatoes. He said it was his favorite (and he's a vegan! ), which felt like a pretty promising review. And oh my goodness, they were delicious. We heard someone throw around the phrase "Peruvian fries." For the lovers of spice, you'll want to gravitate to this dish. This dish is so popular back in Philly, it made the cut for Washington, D.C. too. But fair warning: if you didn't like the spice of the peruvian potatoes, don't go near these noods. But if you do like spice, order double. Their hot flavor comes from sichuan peppers — you know, the kind of spice that builds over time and leaves you sweating. The flavor additions from the five spice mushrooms and zucchini keep you savoring every last bite. Okay, so when it came time for dessert, we rallied to stave off a food coma. Feeling at a loss for what would finish of the meal perfectly, we again turned to (our waiter-turned-trusty-ally) Adam for his recommendation. Hands down, the Uber Luxe, he said. So we went for it. I won't tell you what was in it, all I'll say is that there wasn't an ounce left by the end. Not pictured (or mentioned) are the cocktails. I will say that they are all amazing — and if you're in a super festive mood, order the piña colada. Fancy Radish is a part of The Apollo space on the ground floor — their neighbors include WeWork H St, State Books, and Wyndham Coffee. The space is slated to open Tuesday, March 20 or Wednesday, March 21. They will be open from 5-10 p.m. daily and will follow with weekend brunch.